The Domestic Security Department （国内安全保护支队）is a branch of the police force within the Ministry of Public Security, specializing in collecting intelligence, infiltrating and dealing with political dissidents, human rights activists, petitioners, religious groups as well as “subversive” activities in the cultural, educational and economics domains. It is a massive, secretive and omnipotent security apparatus within the giant police machine of the PRC. The goal of domestic security protection is to strengthen the ruling position of the Chinese Communist Party, protect the regime of the People’s Democratic Dictatorship and socialist system, ensure the smooth carrying out of the socialist modernization construction. 1, People who have social influence – they do not need to be social celebrities, but within China, they have broad social networks or become spokespeople of a group with common experience. 2, People who have their own distinct views in the economic, cultural and political domain, they possess different views from the authorities or “main melody” and insist on expressing their views. 3, Possibly related to rights protection – protecting economic rights, such as apartment owners of urban residential blocks or peasants who lost their land; protecting political rights, such as journalists, writers who insist on freedom of the press or freedom of expression, or house church members who maintain their beliefs, or Tibetan Buddhists who support the Dalai Lama. Within the Domestic Security Department, the general components are office; information, intelligence and external liasion branch; social investigation and local work-directing branch; ethnic and religious investigation branch; anti-subversive and sabotage investigation branch; university, cultural and economic domain domestic security protection work-directing branch; domestic security protection case investigation branch; and anti-cult investigation branch. The following internal document, a paper written by a local Domestic Security Officer from Shaoxing city, Zhejiang Province, was leaked into Chinese cyberspace recently, and reveals many details about how this secretive police force works day-to day at the local level to control Chinese society. The original passage is excerpted from a book entitled Collected Essays on Domestic Security that is circulated internally within the Domestic Security Department (DSD). CDT translated the selected text here; thanks to the translator who wishes to remain anonymous. These last several years, the DSD system in our city has made it its number one priority to protect social and political stability. [The DSD system has] used “the experience at Fengqiao,”* which gave rise to the DSD’s work, as a powerful weapon to further the work of the DSD, persisted in its unmoving commitment of following the path of working with the masses, continued to strengthen the foundation of the DSD, powerfully promoted the healthy development of the DSD’s work, and effectively ensured the social and political stability of the city. I. Using the “Four Uniteds” to clarify the direction of working with the masses. [We have striven to] use “the experience at Fengqiao” to organically integrate the four aims of grasping the actual situation, understanding development, understanding discipline, and accomplishing work goals. [We have striven to] locate the DSD work’s focus, difficulties, and points of integration so as to clarify the direction of the DSD’s foundational work of following the path of staying close to the masses. It has consistently been the DSD’s utmost priority to establish mechanisms to work with the masses, and to continually perfect these mechanisms through examination and through guidance. After several years of exploration and experience our city has basically developed a comprehensive and thorough scheme implemented in cities, counties and townships to correlate the work of the DSD with the masses. (1) The “three groups” ensure organization between the work of the DSD and the work of ensuring social stability. The first group is the Party Committee and Government head leadership council. The Public Security Bureau branch leaders participate in the work of preserving social stability within the region. The next set of groups is the various specialized small leadership groups attended by those responsible within the DSD and organized by the top Party and government branch leadership. The final group conducts meetings involving the main leaders of the Party committee and government. Those responsible within the DSD participate in small groups that focus on preventing large mass incidents and punishing and trying those involved. (2) The “three meetings” refer to regularly scheduled domestic security report meetings, serious incident analysis meetings, and specialized work correlation meetings. These meetings ensure the timely communication of intelligence information and the correlation of command mechanisms. They also aid in ensuring the Party committee government leadership’s complete control over the direction and content of the DSD’s work. This in turn helps the Party committee government leadership understand and support the DSD’s actual work. 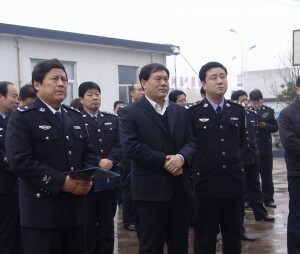 (3) The three reports refer to a system of reporting in which the head of the Public Security Bureau regularly reports to the Standing Committee of the People’s Congress on the periodic work of the DSD and the Government Stability Preservation Leading Group Office, a system of reporting in which DSD intelligence information is carried through executive channels, and a specialized system of reporting in which in specified circumstances, the DSD will use special channels to report directly to major leaders within the Party committee and government. In addition, in 2004, the municipal Party Secretary instructed DSD departments that certain specific intelligence information should be carried directly to him/her through specified confidential channels. 2015.04.23 Netizen Voices: “Who Let You Provoke Uncle Ou”?